Did you know that almost every indoor environment has mold at low levels? It’s true! But when there is visible mold in a home or the number of airborne mold spores is higher than normal, a mold problem exists. I am going to tell you something right away about mold inspections and mold testing that other company’s don’t want you to know. If you already see visible mold, you usually do NOT need a mold inspection or mold testing. If you already see visible mold, you simply need to remove it following industry standard guidelines. If you already see visible mold? Don’t you need to know, for example, what kind of mold it is so you can determine whether its toxic? In fact, in most cases, the surprising answer here is “no.” For starters, so called “Black Mold” is a term that is badly misused and misunderstood. Once you already see visible mold, knowing what type it is, for example, is usually irrelevant because at this point, you or a Mold Professional simply need to get rid of the mold following proper Mold Remediation and Mold Removal Principles. If a mold inspection and mold testing is necessary, there are three basic steps Tri-State Home Inspections LLC takes with every mold inspection. Mold inspections involve carefully inspecting your home for signs of water intrusion and mold growth. This process usually take about 1 hour to perform. Tri-State Home Inspections LLC will also perform an air quality and/or direct sample test to help identify the magnitude of the problem. That test will be shipped to an accredited 3rd party lab for analysis. Tri-State Home Inspections LLC will contact you within a couple of days and provide a copy of the 3rd party lab results and a written report. This written report will explain the lab results and our findings in plain, easy-to-understand English. It will also include a plan for mold remediation and fixing the mold problem if one is identified from the mold inspection results. If a mold problem is located Tri-State Home Inspections LLC will be avaialable to perform follow up testing to confirm the mold has been removed and the problem repaired. Remember this simple rule: If you can already see mold, you need to remove it. Testing is usually unnecessary at this point. 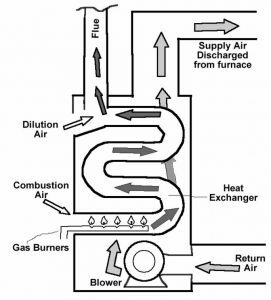 The pilot light ignites a series of burners inside the combustion chamber that then enters the heat exchanger, where the heat transfers to the air in the home with the use of a fan to heat the home to the set point of the thermostat. In an 80% efficient furnace 20% of the heat is loss in the combustion and goes out the chimney. 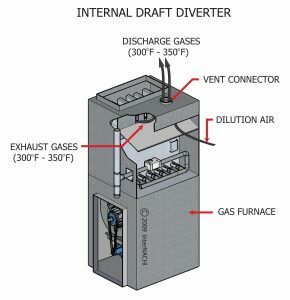 Low and Mid efficient furnaces have one heat exchanger usually 1 gas valve setting, and standard fan adjusted to one speed for heat, cool or just fan. They require a chimney to vent the flue gases to the exterior of the home, with temperatures of up to 300-350 degrees. High efficiency condensing furnaces will have two heat exchangers, the standard heat exchanger as well as a second heat exchanger the flue gases are run though to extract as much heat from the system as possible. 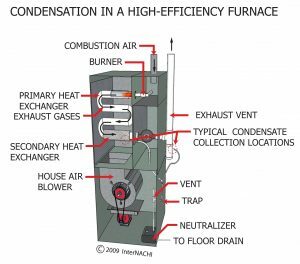 This process does cause condensation that is why they are called condensing furnaces. Because of the secondary heat exchanger these furnaces use PVC exhaust pipes with a temperature of about 100 degrees. 2 – stage furnace will operate in its low-fire stage during periods of mild weather (pushing less air through the ducts and less combustion gas through the flue), and automatically ramp up to its second high-fire stage during extremely colder weather. This will cause the home to experience fewer and much less severe temperature swings in the home, which will result in greater over-all comfort for you and energy savings. When sit to fan mode it will operate the fan at 1/8th the cost of the traditional fan. With return air that cold, flue gas will condense in the primary heat exchanger causing rust & corrosion. In the event that the furnace is not operating here are a couple recommendations to check before calling an HVAC specialist. Turn off the main switch to reset the control board, remove the air filter and turn back on. If the furnace starts most likely a dirty air filter, install a clean filter. If this does not work check the exterior of the vent pipe for a blockage, if blockage is found turn off main switch then turn back on to reset control board and see if it runs normally. If neither of these works. Call a licensed and insured HVAC contractor for further evaluation and repair or replace as warranted. 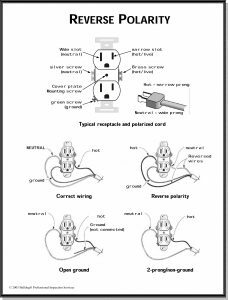 Reverse Polarity is a common problem I come across either in the outlets or with the home’s wiring. Home wiring is color coded, Black is HOT (often called the live wire) and WHITE is NEUTRAL. This is different from 12 volt systems where the black is often the neutral, it is very important to understand how wiring differs for a home over an automobile. An outlet that is wired backwards is a reversed outlet, the terminals on a outlet is colored to let you know what is the hot side and what is the neutral. Brass is hot (black wire) the silver is neutral (white wire). If an outlet has reverse polarity is it hard to tell unless it is tested because alternating current (AC) will only travel in one direction like water flowing in the river. If it was hooked up to direct current (DC/12 volt battery) the motor would rotate in the opposite direction and is very easy to recognize. The reason that reversed polarity can create a shock hazard in certain situations is because the switch is positioned before the hot wire side enters the appliance and the neutral is connected to the other end of the appliance circuitry, when the polarity is reversed the appliance circuitry is electrically charged all the time, but only functional when a switch closes the neutral wire connection and the current begins flowing. 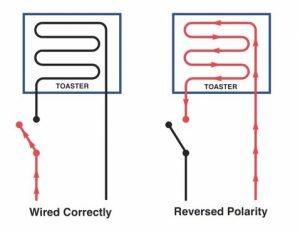 Using the diagram of a toaster below I can show you the difference in a correctly wired and a reversed polarity outlet. The left toaster is wired correctly with the circuit being live only up to the switch. The right toaster with reverse polarity has all the wiring live up to the switch. With the toaster reversed if you were to put a knife or fork into it you would get shocked. This also works for a light bulb socket, the metal shell would become electrified and cause a shock if touched. If the wiring is correct it is harmless to touch a lamp shell or stick something in a toaster. Reverse polarity needs to be repaired and is usually simple, most of the time just switching the wiring around. If you are comfortable working with electricity it is a easy DIY project, if not call a licensed electrician. If the whole home wiring is reversed then the services of a licensed electrician will be needed. The only way to know if your wiring has reverse polarity is to test it, the easiest and simplest way to test is to purchase an inexpensive three light circuit tester at any hardware store. Inspecting older homes the most common defect I find is bad electrical outlet upgrades. Usually the outlets are upgraded by homeowners or other non-qualified person to do electrical. The following is the verbiage I use in my report. Installing a 3-prong outlet on a 2 wire system is wrong and not up to any codes, but is happens in many older homes. The purpose of the ground is to provide an alternate path for the electrons to flow back to the main electrical panel. If there should be a short, the electrons do not have an alternate path back to the electrical panel without the grounding wire. Know the 3-prong outlets are not grounded and use as a 2 prong outlet with no ground. This condition needs to be disclosed to anyone using the outlet. The 3-prong outlet will give a false sense of security about the outlet being grounded. Certified Master Inspector serving the Tri-State Area since 2009. I can help you to understand how your home works and how to get the most potential from the home. With this blog I will be giving valuable information about homes. If you have a question feel to contact me anytime by email or phone.